Yarn Candy Monday: Bamboo, Merino, and BUNNY... mmmmmmm. I decided over the weekend that I should try and process some of Ruttiger's fluff... just to see what it would be like. I have 2 good sized shoeboxes full of "combed" fur, aka the stuff that tangles around the wire comb when I am grooming him, and even though the little poofs are tangled, I wondered what a little pass on the handcards would do to them. Well here is the result! I did not measure or weigh anything. I simply layered the 3 fibers and carded gently. Big Big Blueberry Bobbins... say that 5 times fast! Every August there is an abundance of delicious local blueberries, delicious to eat as is, or bake with, or freeze to use later... and in my house - even the fiber I've been spinning is Blueberry in colour! - From Belfast Mini Mills, Belfast P. E. I. 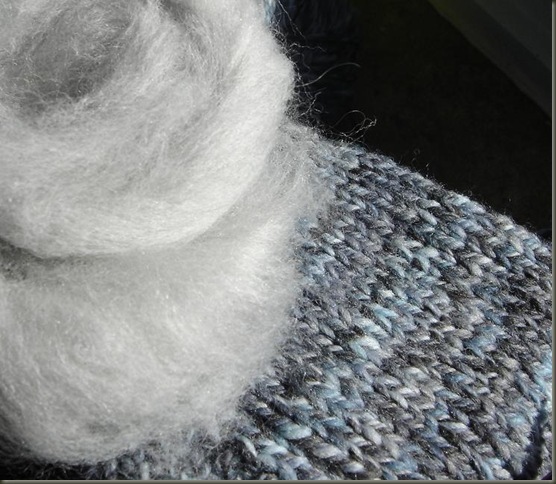 This fiber is like cotton candy in a bag.... sweet and soft and smooth. I am not sure exactly how the roving was prepared, but the mix was very light and airy. The Merino/Alpaca Content was dyed a lovely navy or blueberry colour, and the silk/bamboo component dyed light blue almost turqouise with some white through it. In places it seemed as though all the fibers were completely blended and were indecipherable, but other areas where the shiny ribbon of silkiness was quite visible. I was unsure how this unevenness would show in the yarn, but because I was planning to do a traditional 3-ply, I knew that even if some of the light colour showed up exclusively in places, the other 2 plies would tone it down. Check That Bobbin! She is Full!!! with 250 yards of continuous yarn... love that length! The end result is a heathery blue yarn, 3-ply of course, at approximately worsted or light worsted weight. With the super jumbo skein and her little sister (not shown) I have about 350 yards of yarn, so definetly enough to make some mittens, and maybe a hat or something too? This yarn is a gift for someone, so it will be up to her what to make with it.... I'll make her photograph it for you to see when it's done. mmm Blueberry... hanging out with our Sci-fi/Fantasy Book Collection. Showing the Geek Colours today aren't we? As I was spinning this blend, there were some areas where the silk/bamboo seemed to "slub" a little, but you can't really see it in the finished yarn. I find 3-ply is great for smoothing out any imperfections in diameter and is pretty forgiving. It is really hard to capture the sparkle and shine of this yarn in a photograph. In the sun, the shiny bits really gleam, and the dark blue looks even darker of course next to the glinting bits. and... you can't have Blueberry Season without having some Blueberry Baking! Mark's favorite... homemade blueberry pie - homemade filling, homemade crust, happy Husband. 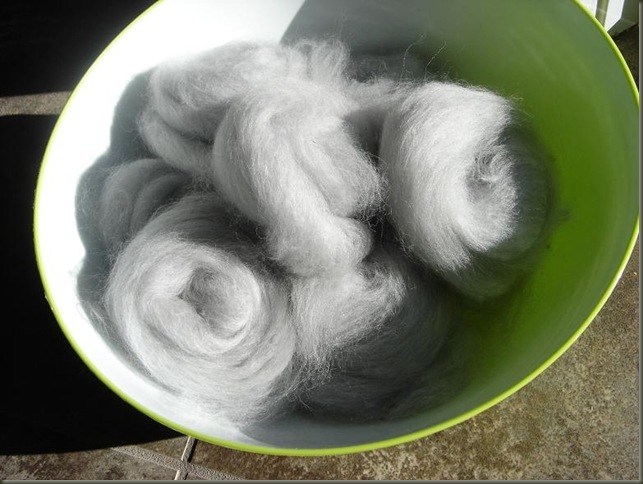 Week 1: Tour de Fleece - Accomplis! I made a special effort to do my spinning every day this week despite feeling tired out with a cold, and itchy with that darn mystery rash... Tonight I finished my Angel Batt Yarn! I decided to go with the straight bamboo single for the second ply. I had been kind of thinking that maybe I would try something new with the plying, but really my blended single was not very thick, so I couldn't do anything too crazy with it... Bamboo has a lot of shine, and I didn't want that to overshadow the softness and pillowyness of the other single. I chose to make the bamboo single a little thinner, so hopefully this woudn't happen. I was right... even though the bamboo single is a little narrower - it just gleams next to the puffy cloudyness of the blended single, and looks pretty much the same size. this stuff is SOFT beyond... and the bamboo makes it feel smooth too. As I have been handling it a little there is a soft angora halo that is starting to show. I think after a wash and a good thwacking that halo will grow a little more too.